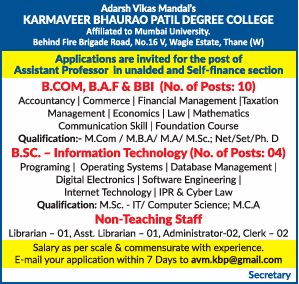 AVM Karmaveer Bhaurao Patil Degree College, Thane has advertised in TIMES OF INDIA newspaper for the recruitment of Assistant Professor job vacancies. Interested and eligible job aspirants are requested to apply with in 7 days. Check out further more details below. About College: Adarsh Vikas Mandal was founded in the year 1984 by our History Chairman Shri. B.B. More Saheb (a renowned social worker & politician in Thane) with a view to provide quality education in Wagle Industrial area. It is area of working class people who faces various problems to get admission for their children. To solve this problem Shri. B.B. More saheb sowed the seeds by starting Primary School .